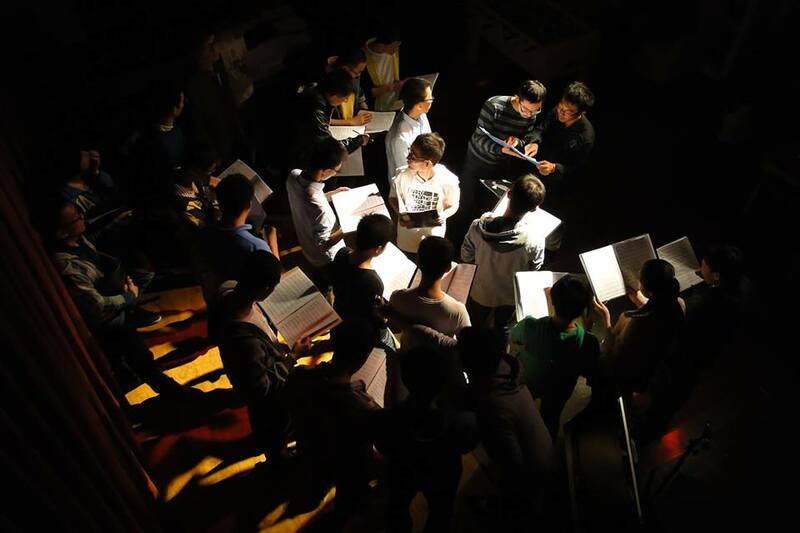 Last night was the silent auction and concert for Beijing’s gay choir The Shining Jazzy Chorus. The event was packed. We did four songs, with Chinese introduction and English translations between a few of them. I spoke before the ‘Thank You Song,’ which is the song I wrote to honor the perk for donors above $500. Chen translated for me. I found it was very fun and easy talking to the audience in that way – we found a great rhythm between the two of us, and the audience laughed and ‘hmmmmed’ in all the right places. The second half began with me singing ‘Dear Dad’ which was the song that brought the Shining Jazzy Chorus to my attention in the first place. It seems Roy, a member of the chorus, was in Seattle for work last year when he saw The Captain Smartypants show featuring ‘Dear Dad.’ He sent an email to the chorus about the song after he got back to China. Since being here I have learned that he was so moved by the song that he used it as a context to come out to his own father. He was terribly nervous about it, but Roy’s father accepted it all very gracefully. Roy still has not come out to his mother or sister, and is debating whether or not he should. We determined I would sing it at the concert. As I described the song to the guys during rehearsal earlier, they all clustered around me in the rehearsal space. I described the scene in Fairy Tales where the father, played by my husband-to-be Paul, sings his response to the ‘Dear Dad’ letter in the memorial service scene. To my great surprise I began weeping copiously. I could not finish telling the story of the scene I was crying so hard. The guys looked at me, their own eyes shining, offering me silent support. It was a powerful moment. I was very concerned that I would cry again, singing the song in the concert. To my relief I did not. The audience applauded like mad. I then told the story of how my own father, after seeing Fairy Tales in Chicago said, “I can see how someone might be moved by that ‘Dear Dad’ song.” And I said, “Might that person be you, Dad?” Chen translated the story for the audience, but stopped short, and said, “I can’t translate that last part. It is too touching.” It all seemed to fit in with the theme of the song – and the fact that it was this song that brought the Shining Jazzy Chorus and me together – so it was all okay. The rest of the concert went quite well. The Chinese song the men sang was fantastic. I had insisted they sing it with no music, and gave them a very specific visual focus point. Right before they started the song I went down the line and snatched the music they were nervously clutching from each of their hands and returned to the piano. The audience laughed. Then they sang the song and KILLED it. We finished with ‘I Say a Little Prayer’ and I joined the basses for a little extra oomph. There is so much about this trip that I just can’t put into words. It is such a 3-dimensional experience for me. I am so grateful this all came together the way it did. Last night’s concert/auction was a small step for them, and my contribution to their musical and stage acumen was a still smaller part of that small step. But they are inspired by me, and I have no problem with letting that inspiration be a catalyst for their own imaginations. I’ve been telling them stories about the choruses I direct, the things we’ve done, the places we’ve gone, the songs we’ve performed, etc. I hope any inspiration I’ve been able to offer them continues to deepen and thrive long after I’ve left. And I hope this is just the beginning of a long, growing friendship between myself and this chorus, and among LGBT folks here and in the States. It really does feel like we are building a ‘rainbow bridge’ as they put in their poster for last night’s concert.